Verlag Font Features: Contextual Figures | Hoefler & Co. Lining figures are appropriate to a Moderist sans serif, but so is a small lowercase. Verlag’s figures find a way to avoid towering over the text. Traditionally there are two kinds of numbers: the fixed-height “lining figures” that accompany the capitals, and the variable-height “old style figures” whose shapes mimic the rhythm of the lowercase. Lining figures are standard with nearly all geometric sans serifs, not only because their shapes can more easily echo the pure geometry of the capitals, but because lining figures have long been associated with the same “modern” qualities that geometric sans serifs evoke. The type designer’s dilemma is that many of the best geometric sans serifs also have very small x-heights, causing these figures to tower over the lowercase and stick out in text. 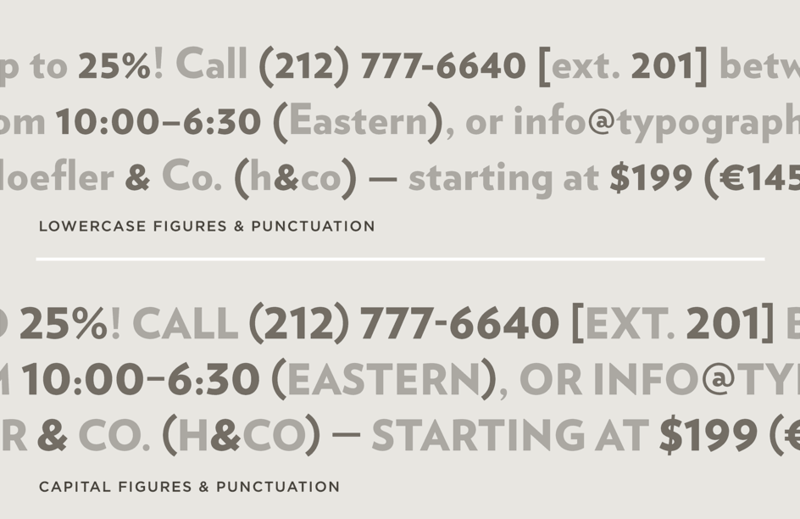 So for Verlag, Hoefler & Co. includes a third option: “short-lining figures,” whose forms feel contemporary without overwhelming the lowercase. Intended for use in text, these figures are in the standard positions in Verlag, its lining figures being accessed through the “all caps” OpenType feature. This same OpenType feature activates the lining punctuation, designed to accompany the caps and lining figures. Verlag includes variants of its monetary symbols, commercial marks, math symbols, enclosures, dashes, slashes, and guillemets. Questions about OpenType? Ask Hoefler & Co..